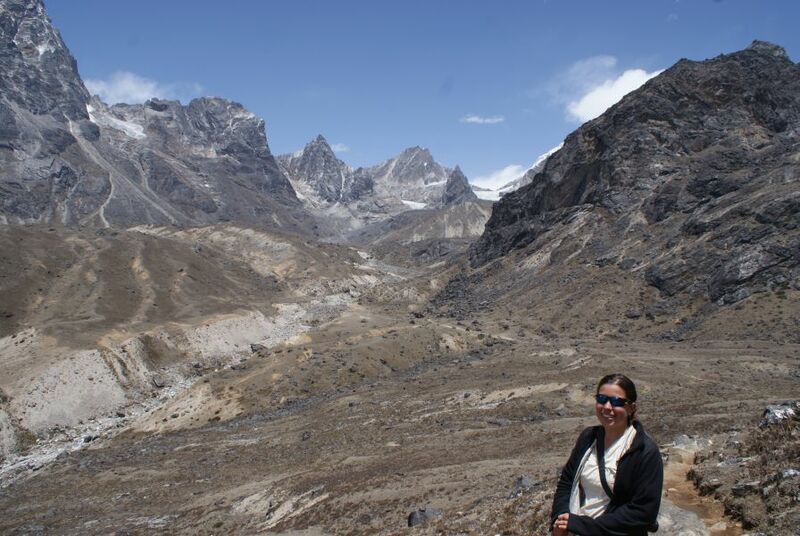 20 May 2010, Khumjung, our 31st Wedding Anniversary! The map below shows our month-long trek through the Everest (Khumbu) region northeast of Kathmandu. This particular newsletter covers our 8 day trek from Gorak Shep (upper right) over the top of the circle and down the left hand side back to Khumjung (at the base of the "circle"). Click to view a larger Khumbu (Everest) Area map. Trails & markers all show text when you click on them. 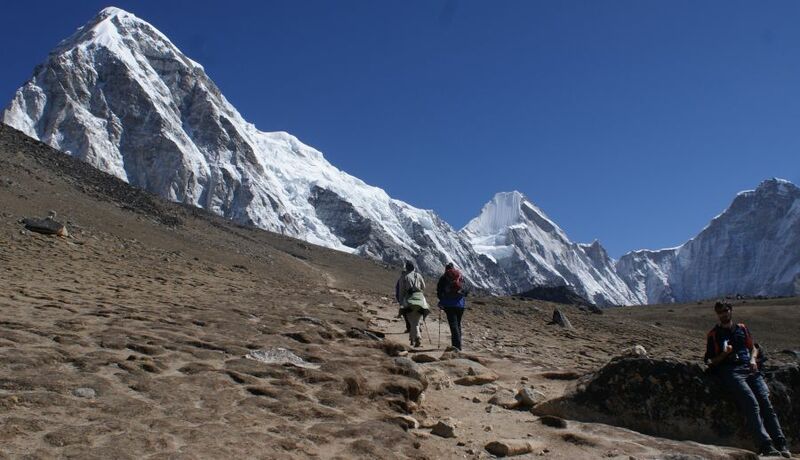 The trail to Base Camp isn't very long, but it's either on the lateral moraine or on the Khumbu Glacier itself. Both are difficult to traverse in their own ways, especially when you're sucking in every oxygen molecule you can find. But the views are stunning! Impossibly high snow-covered peaks surround us and the glacier is full of interesting formations. Large rocks will often shade the ice under them, so the ice won't melt when the rest of the glacier does, and the rock ends up at the top of an ice pinnacle. 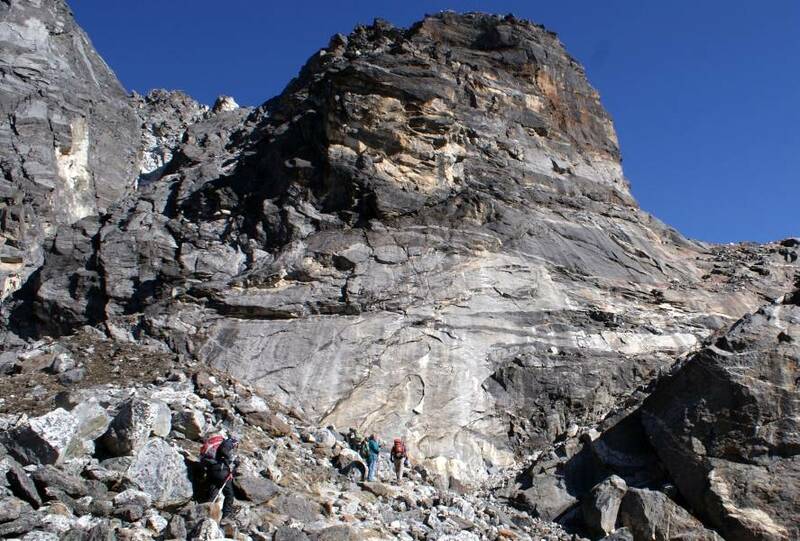 In 1980 the trail traversed much more of the glacier and was a bit dangerous in the afternoon, as melt-water streams could expand to block the trail. 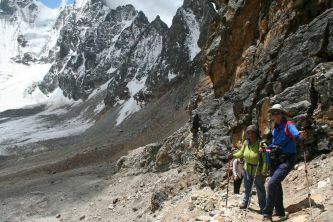 But today the trail goes further along the moraine and spends much less time on the glacier. Mt Everest itself can not be seen from base camp, as it's hidden behind closer peaks (actually, one of its own shoulders). It can sometimes be seen poking out from behind other mountains as you approach base camp. Only experienced climbers proceed beyond base camp as the very first leg, the notorious Khumbu Ice‑Fall, is arguably one of the most dangerous parts of the whole ascent. 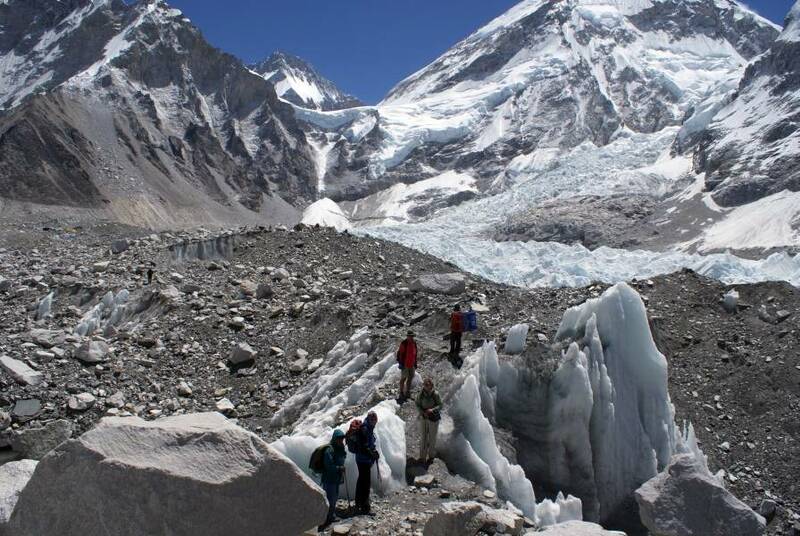 The huge ice blocks of the Ice‑Fall are constantly moving so the trail through it has to be rebuilt every day. Usually one climbing group maintains the trail through the Ice‑Fall and all the other groups pay them for that service, just as one group fixes ropes for everyone else to use. Camp 1 is just above the Ice‑Fall, Camp 2 is further up the (relatively flat) glacier, Camp 3 is perched on a steep slope at the back of that valley, and Camp 4 is on South Col, the pass between Everest to the north and Lhotse to the south. 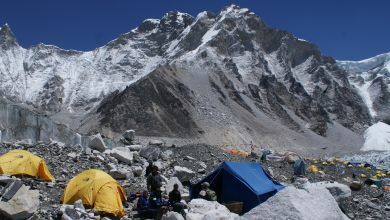 Climbers will leave Camp 4 at about 2am to try to reach the summit. 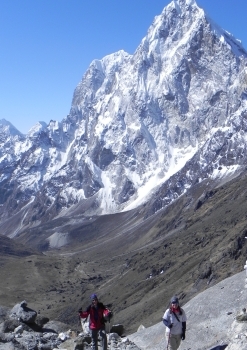 Prudent climbers will set a turn‑around time of about 2pm and will start back down at that time, no matter what. 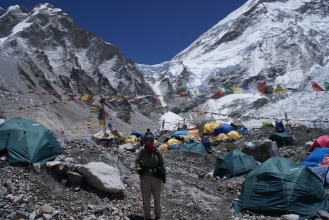 Failure to do that caused a number of deaths on 10 May 1996 when a storm blew in and prevented many folks from returning to South Col.
Base Camp is a vast sprinkling of small orange tents on tenuous icy perches with strings of prayer flags strung everywhere for good luck. There are about 35 groups up here and hundreds of people. 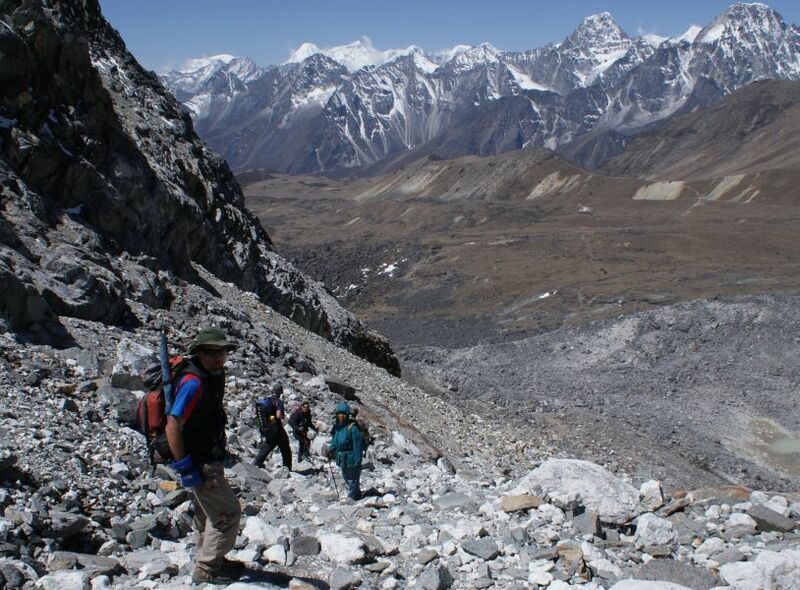 A constant stream of yaks and porters bring in supplies and take away garbage. 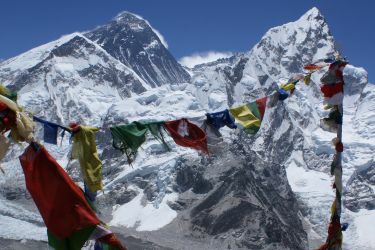 In theory, nothing is left behind except footprints and prayer flags, although some teams have left tents or spent oxygen bottles, especially at Camp 4. 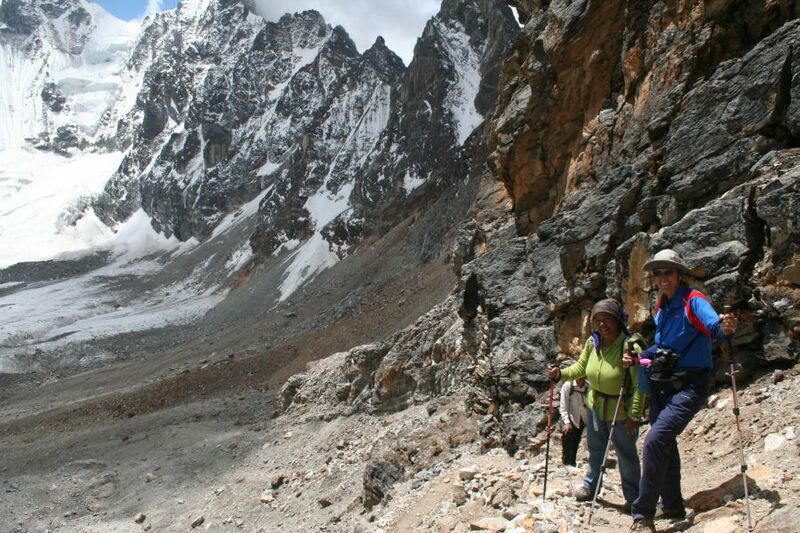 While we were at base camp we also saw them bringing out the body of a climber who had died 5 years earlier, but who had only just been recovered. 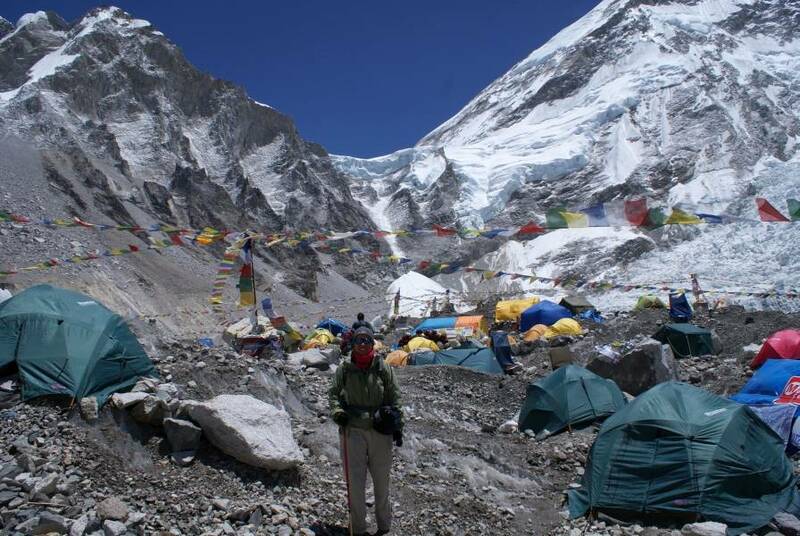 We had invitations to visit 3 different groups at Base Camp but we only got to 2 of them. First was the son of The Man Who Skied Down Everest (the movie came out in the late 70's). Gota Miura had summited twice and was now doing a solo cleanup climb, pulling garbage and left over gear back down from the slopes of Everest to be carried down to Shangboche airstrip (near Khumjung) and flown to Kathmandu for disposal (there were 6 such cleanup expeditions at Base Camp). 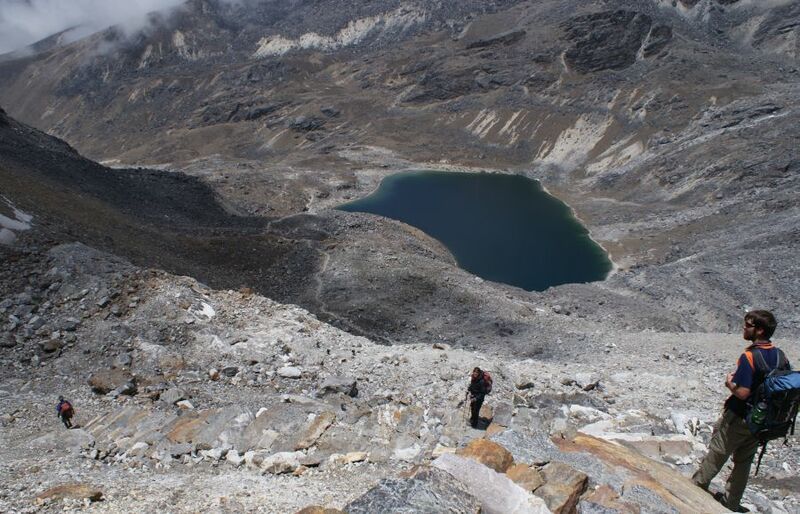 Gota is Japanese and doing his doctoral dissertation on high-altitude hypoxia. He gave us invaluable help when we were having issues adjusting to these altitudes. His father used to hold the title of the oldest man to summit Everest (at 70) but a Nepali claiming to be 76 took the record a few years later. Since Nepali's don't record birthdays and usually have only a vague idea of how old they are, this claim is in some dispute. For instance, in 1974 Pema's husband Nima claimed to be 3 years younger than Sue, but in 1980 he claimed to be 3 years older than her! Most of our Sherpa friends really don't know how old they are, even the young ones. Gota and his father plan to try again when his father is 80 years old! We also visited Pushkar Shah, an amazing Nepali who spent 11 years bicycling around the world and is planning to cap it off by summiting Everest. He visited 150 countries on his 11 year World Peace Tour. In a way, his trip parallels our own journey - trying to bridge different cultures, to get them to know and understand each other better, thereby achieving dialog and cooperation instead of conflict. Hopefully this increased understanding of the values that each culture holds will help improve international relations. Pushkar had a string of 150 flags from all the countries that he visited that he wanted to place on Everest's summit. He left Nepal with only one Euro, and relied exclusively on gifts and the generosity of those he came in contact with to finance his trip around the world. Truly an amazing achievement. His website is http://PushkarShah.com. 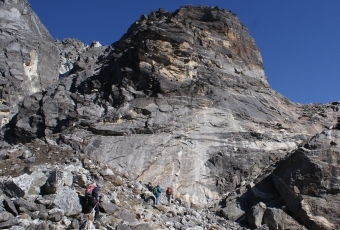 Kala Pattar (Black Rock) is actually a hill at the base of magnificent Pumo Ri. It offers one of the best views of Everest and the whole Khumbu valley. It took us 2 hours to climb the 1,300' (400m) at this altitude but at the top we were treated to stunning views of Everest, Lhotse, Nuptse, and the mountains on the other side of Lho La that are actually in Tibet. The icy wind was howling so we could only stay for 30 minutes, but we took LOTS of photos in that time. 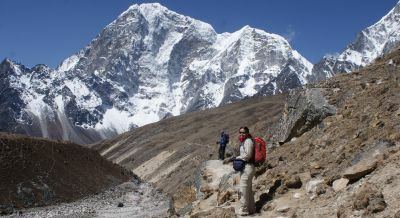 When we came down we had a nice, warming soup lunch and then packed our bags and hiked back down the Khumbu valley to Lobuche at 16,200' (4,910m). 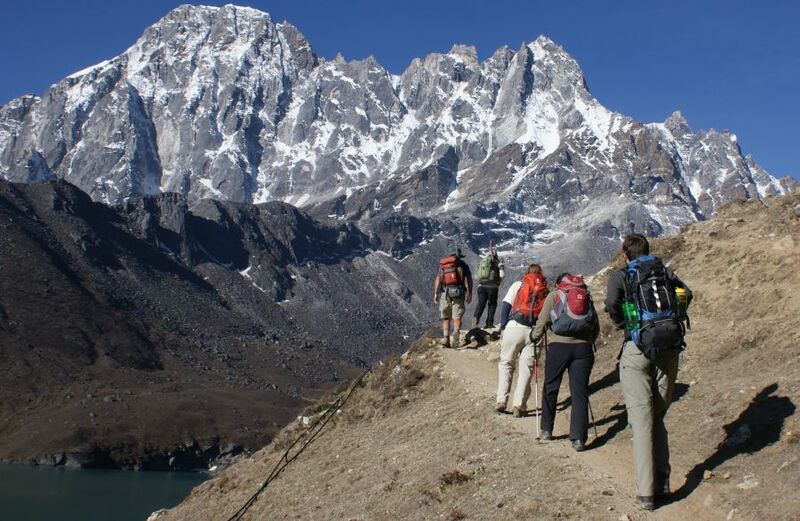 This is the start of our 2 day trip over the Cho La Pass to the Gokyo valley. That night we met the very interesting Jack Starmer. 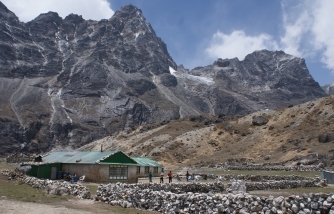 Jack runs a private aid organization that brings together Nepali and western medical volunteers who run 5 day health camps at remote Nepali villages. In those 5 days the 30 or so volunteers treat 3,000‑4,000 Nepalis, including some surgeries. Jack's website is http://HealthCareNepal.org. It apparently runs with extremely low overhead - in 2009, 96¢ from every dollar received went directly to their projects and programs. 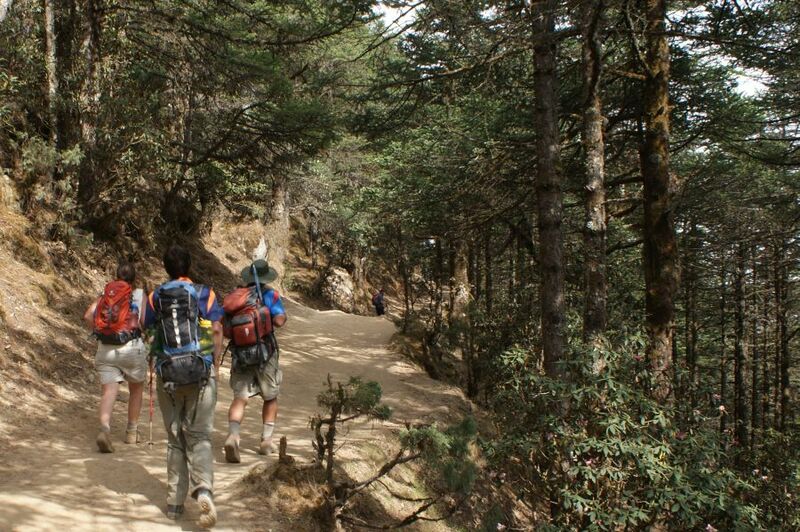 Our walk to Dzongla was a treat, mainly because most of it was pretty level - a novelty for Sherpa trails. 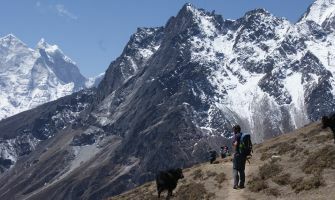 The trail started back down the Khumbu valley but before it got to the steep down at the terminal moraine it branched right and contoured around a ridge, high above the busy Everest Highway below, and then turned northwest towards Cho La pass. 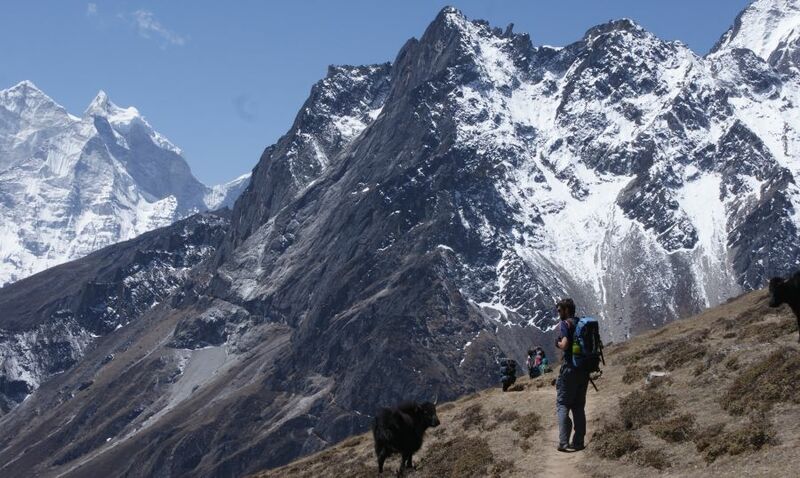 The weather was clear and bright so we could easily see down the valley towards Kangtega and Ama Dablam. The trail went gently up above a large lake, beside tufts of blooming purple and yellow dwarf rhododendron and low juniper bushes, as the valley slowly came up to meet us. The guesthouse was pretty basic, with only a few tiny rooms and only very rustic facilities - the outhouse was across a yak-pasture and I think our Sherpas ended up doing most of the cooking. But it started snowing in the afternoon and the neighboring guesthouse was closed so we were glad to have a roof over our heads at all! 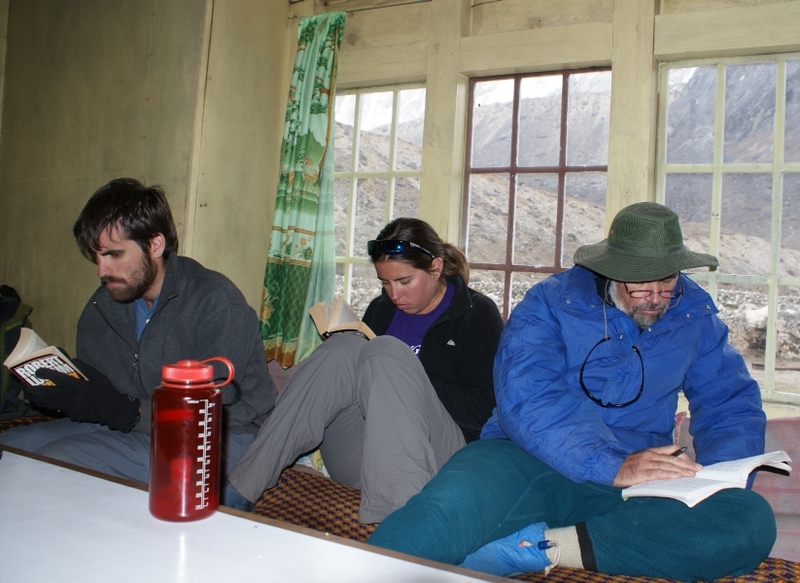 Some trekkers who arrived later had to sleep in the dining room so we considered ourselves lucky to have 3 rooms to ourselves (our Sherpas slept in a big dormitory setup especially for Sherpas). Despite last night's snow flurries and clouds, the day dawned brilliant and by 6am we were fed and on the trail to our toughest pass. We left the yak pastures after only a few minutes to begin a 1,600' (500m) climb up to a rather vertical rock cliff where we were using our hands to pull ourselves up huge boulders. 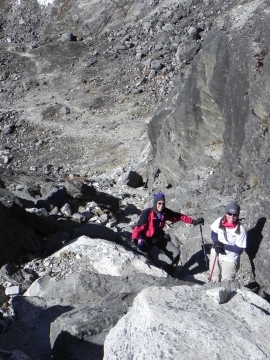 Two hours into it, Sue and Amanda were very happy to see our cheerful young porters bounding back down the rocky trail. They'd dropped their loads at the top of the rocks and then come back to relieve us of our day packs, which had felt heavier with each step. The top of the cliff was not the top of the pass, but merely where the rock gave way to the glistening ice and snow of the glacier. Crossing the glacier was like walking on a gently sloping snow field with intricate, crunchy ice formations under foot. At this elevation we were taking one full breath, in and out, for each step, perhaps 30 full breaths every minute or one every 2 seconds. (I was too scared to take my pulse, but both pulse and respiration were pretty much maxed-out). 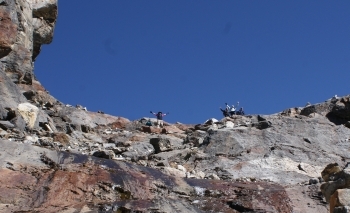 Slowly we gained the top of Cho La, where we sat on warm rocks under waving red, blue, yellow and green prayer flags. We snacked on granola bars, nuts and raisins, and icy cold water, while marveling at the wild rocky crags above us and the immense Himalayan peaks to the east and west. At 10am we began the risky descent down a boulder and scree slope which is stable only in the morning before the warming sun melts the night's ice that holds the rocks in place. For the next 4 hours we worked our way down the rocks, and then thru blessedly green meadows of juniper and dwarf rhododendrons to our next lodging at Dragnag. The strenuous climb followed by the long decent, all of it above 15,000' (4700m) had us pretty wiped out when we arrived at the guesthouse but some showers and stretching out helped a lot. Being footsore from the grueling Cho La, we "slept in" the next morning until 7:30. After a leisurely breakfast we took off for the settlement at Gokyo, which lay just across the massive Ngozumba Glacier. Local knowledge was useful here, as the maps show only the old trail which is now blocked by a deep blue-white glacial lake. 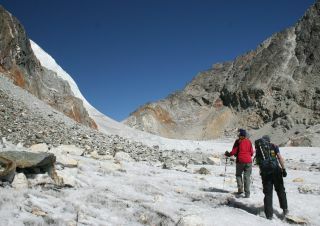 The new trail at times seemed impassable to all but humans, but along the way we passed evidence of horse and yak trains that had made their way over the ice and rocks, up and down the lateral moraines. From the top of the western moraine we looked down on the stunning deep blue of Dudh Pokhari, the largest of the 3 Gokyo area lakes. From nothing more than a cluster of rock shelters and yak pastures in 1980, Gokyo has now grown into a village of 5 guesthouses on the eastern shore of the lake. We stayed at a lodge right on the lake run by a Sherpa widow and her 2 teens, and felt pampered with hot teas, tasty pizzas (made on chapatis), and spicy Sherpa stew. The upstairs dining room gave us a great view and a comfortable place to hang out. Always gluttons for punishment and seekers of better views, we spent our "lay day" in Gokyo pulling our tired bodies up 1,900' (600m) to the top of Gokyo Ri. The top was festooned in hundreds of strings of prayer flags and stunning views of glacier-clad mountains. The top of Gokyo Ri is high enough to see the mountains over the ridge to the east so we clambered around boulders taking pictures of Everest, Lhotse, Nuptse, and the awesome snow/glacier wall of Cho-Oyu on the Tibetan border to the north. After an energy restoring snack in the shelter of some boulders we returned to our lodge in time for a late lunch and a typical trekking afternoon spent recovering in the dining room, chatting to other trekkers, writing in our journals, taking photos of the clouds playing with the peaks, and anticipating dinner! 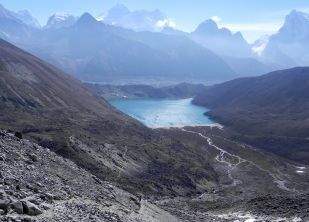 Today we headed due west from Gokyo to tackle Renjo La, a relatively newly opened pass. 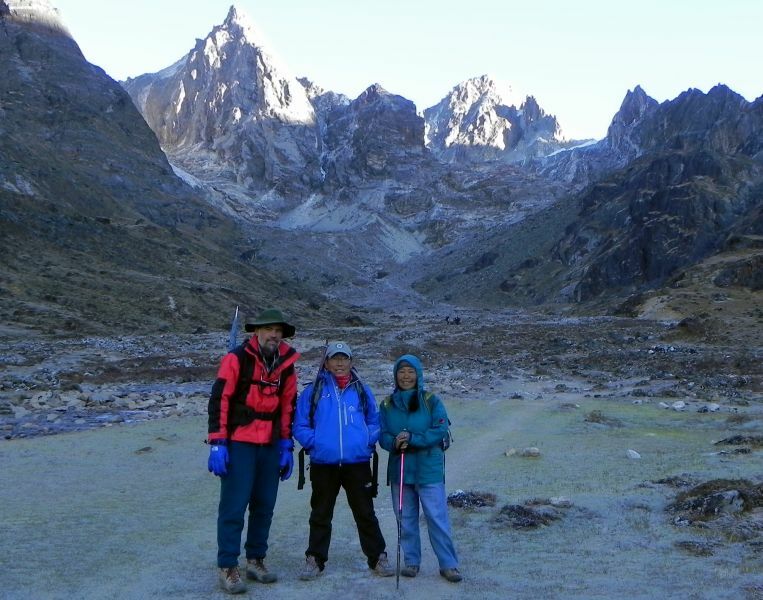 We climbed the short steep loose gravelly eastern side, to enjoy new views of Himalayan peaks to the west. Concerned that we were facing another killer slog down a scree slope to the east like we'd had on the Cho La we were amazed to face a long, impossibly steep but extremely well built rock staircase! In 2005 a Sherpa in Lungde used Himalayan Trust Community funds to build a staircase that is wide enough to allow horse and yak trains to transit the pass. Our aching knees attest to the long day to Lungde - more than 7 hours of rugged hiking, dropping 3,200' (1000m) to our distant guesthouse. Today was another LONG day, as we descended from Lungde along the white roaring Bhote Kosi river that drops from Tibet into the Khumbu. The trail tended gently down as we passed through very old villages that are not yet spoiled with trekkers, where the roofs are still built of slate and rock instead of the ubiquitous corrugated sheet steel. This valley was closed until about 1995, as Nepal was concerned about the security of the border -- this trail leads to one of the "easiest" passes into Tibet. After 9 days in the high alpine land of rock and ice it was refreshing and beautiful to find ourselves back in pastures, meadows of blooming dwarf rhododendrons and newly greening potato fields. We side-tracked across the river into the village of Thame not only for lunch but also to choose the lodge we will use for our stay during the Mani Rimdu festival in a few days. From Thame we chose to trek all the way back to Pema's home in Khumjung -- another 4 hours of traversing down the valley. We went back down through the tree-line and our surroundings changed gradually to glorious rhododendron, fir and birch forest. Just when we were ready for the trail to stop it went up, up, up to Khumjung. Hard work after a long day but the surrounding hills were bursting with spring color, hillsides glittering with blooming yellow rhododendrons and the new green of the potato plants in the walled fields. It felt like coming home. Today, 20 May 2010, is our 31st wedding anniversary! 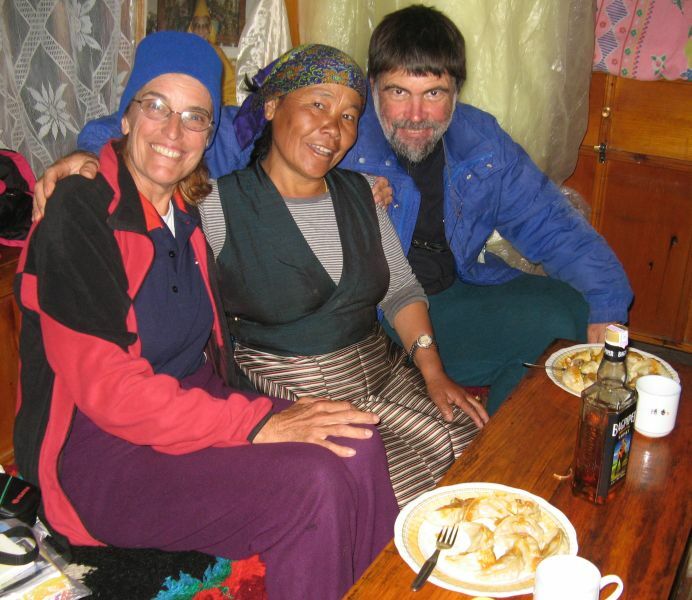 30 years ago today we were camped in our little dome tent outside Dingboche, where Pema and her late husband Nima presented us with an elaborately decorated fruitcake (cooked in a pressure cooker over the fire!) and a small bottle of Khukri Rum to go in our hot chocolate. Tonight Pema honored us with a huge meal of her delicious Momos - spicy meat filled pastries served with a spicy tomato topping. While we've had momos elsewhere, Pema's are always the best! The celebrations included our guide Tenzing (reunited with his wife, Phu Doma, and their 2 young children) and our 3 porters. Laughter and story-telling (and rum for the hot chocolate) lasted well into the night, as a good celebration should!